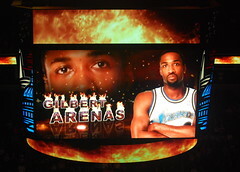 The news has just about come down from NBA Commissioner David Stern, Gilbert Arenas has been suspended for the rest of the season after pleading guilty to felony firearms charges. The official word from the Wizards isn’t expected for a while yet, but David Stern expected to face the press soon. Here’s hoping the Wizards cut this joker loose.